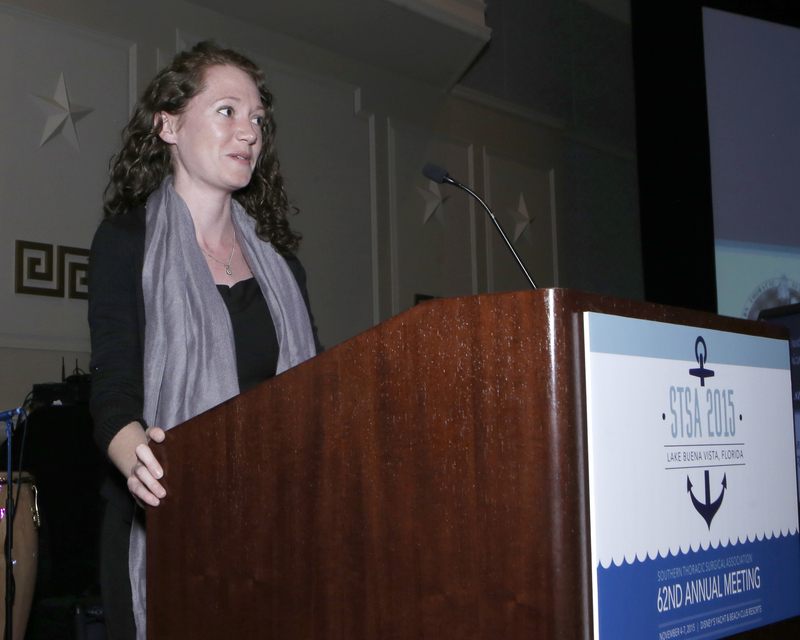 Emily A. Downs, MD accepted the 2015 STSA Hawley Seiler Award during the 62nd Annual Meeting Awards Dinner & Dance on November 7, 2015 in Lake Buena Vista, FL. The STSA 62nd Annual Meeting was held November 4-7, 2015 at Disney’s Yacht & Beach Club Resorts in Lake Buena Vista, FL. Over one hundred cardiothoracic surgeons and trainees presented their scientific research throughout the meeting. Each year, the STSA President works with STSA Council and Program Committee members to select four scientific paper award recipients. The 2015 Clifford Van Meter President’s Award was given to Anthony L. Estrera, MD for his Postgraduate Program presentation titled “Lessons learned from Total Aortic Replacement.” Dr. Estrera is Professor and Chief of Cardiac Surgery in the Department of Cardiothoracic and Vascular Surgery at the University of Texas Houston Medical School in Houston, TX. The Clifford Van Meter President’s Award is given annually to the best adult cardiac surgery paper delivered at the STSA Annual Meeting. It is given on the basis of originality, content, and presentation. The 2015 Carolyn Reed President’s Award was given to Jonathan Spicer, MD for his paper titled “The Influence of Reconstructive Technique on Perioperative Outcomes Following Chest Wall Resection.” Dr. Spicer is a general thoracic surgeon at McGill University in Montreal, QC, Canada. The Carolyn Reed President’s Award is given annually to the best general thoracic surgery paper delivered at the STSA Annual Meeting. It is given on the basis of originality, content, and presentation. The 2015 George Daicoff President’s Award was given to James D. St. Louis, MD for his paper titled “Anomalous Aortic Origin of the Coronary Arteries: The Impact of Major Associated Congenital Cardiac Lesions.” Dr. St. Louis is Chief and Associate Professor Division of Pediatric Cardiac Surgery at the University of Minnesota in Minneapolis, MN. The George Daicoff Award is given annually to the best congenital paper delivered at the STSA Annual Meeting. It is given on the basis of originality, content, and presentation. 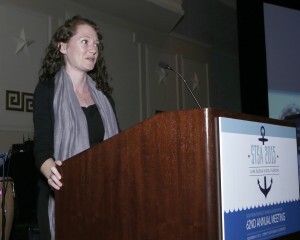 The 2015 Hawley Seiler Residents Competition Award was given to Emily A. Downs, MD for her paper titled “Minimally Invasive Mitral Valve Surgery Has Superior Outcomes To Conventional Sternotomy Without Increased Costs.” Dr. Downs is an I-6 resident at the University of Virginia Hospital in Charlottesville, VA. The Hawley Seiler Residents Competition Award is given annually to the resident presenter excelling in abstract quality as well as manuscript and oral presentation. Reference the 62nd Annual Meeting Program Book to review presenter abstracts. Visit www.stsa.org/awards to view a full list of 2015 Annual Meeting award recipients. Thank you to everyone who presented at and participated in the STSA 62nd Annual Meeting. Save the date for the STSA 63rd Annual Meeting, which will be held November 9-12, 2016 at Naples Grande Beach Resort in Naples, FL. Submit an abstract for presentation at the 63rd Annual Meeting and compete for a 2016 Annual Meeting scientific presentation award! The 63rd Annual Meeting abstract submission process will open in February 2016.